I was following an email discussion late last week regarding the search for some online principles of cartographic design. Many exist in various books that those with a cartographic background are aware of but, of course, people prefer to want their information for free via their glass lens on the world. Actually, there aren't many online. Ordnance Survey have some here which are certainly worth a look but it's still books that get into the detail you'll need if you're going to really learn about cartography. Some see principles as rules but that gives them a status of authority and absoluteness that suggests they shouldn't be broken at all, at any cost. There are some rules in cartography (such as which govern effective text placement; or to process data into a rate for a choropleth map) but I see principles as guidelines that provide oversight for the map you're making. I'm happy for them to be challenged and broken and innovation often comes from that process. I'm also strong of the opinion that if you know some principles you're in a good position to also know when and how to challenge them in your design. You'll also be able to easily recognize when a map eschews principles and simply fails. One of my friends from the UK, Alan Collinson (of Geo-Innovations) reminded everyone in the discussion of the principles that the British Cartographic Society Design Group drew up some time ago. I'm guessing this would be the late nineties or thereabouts. I have a vague memory of them at the time but the internet wasn't then what it is now and these ideas tend to get lost. Many good cartographic minds and practitioners conceived of them so I thought it worth posting them here, as is. Some may find them helpful. Interestingly, the principles are prefaced with three statements and as you read through you can see the underlying current of fear about the spectre of GIS as a threat to cartographic design. Perhaps the parallel now is the threat to quality by ubiquitous citizen mapping? The purpose of cartographic design is to focus the attention of the user. The Principles of cartographic design are timeless, the results are not. The rules of cartographic design can be taught and can be learnt, principles and concepts have to be acquired and practiced. Without a grasp of concept the whole of the design process is negated. The parts embarrass the whole. Once concept is understood, no design or content feature will be included which does not fit it. Design the whole before the part. Design comes in two stages, concept and parameters, and detail in execution. Design once, devise, design again User first, user last. What does the user want from this map? What can the user get from this map? Is that what they want? If a map were a building it shouldn’t fall over. Important things must look important, and the most important thing should look the most important. "They also serve who only stand and wait". Lesser things have their place and should serve to complement the important. From the whole to the part, and all the parts, contributing to the whole. Associated items must have associated treatment. Harmony is to do with the whole map being happy with itself. Successful harmony leads to repose. Perfect harmony of elements leads to a neutral bloom. Harmony is subliminal. Great design tends towards simplicity (Bertin). Its not what you put in that makes a great map but what you take out. The map design stage is complete when you can take nothing else out. Running the film of an explosion backwards, all possibilities rush to one point. They become the right point. This is the map designer's skill. Content may determine scale or scale may determine content, and each determines the level of generalisation (sacrifice). well designed map has clarity. Clarity is achieved by compromise. All designs are a compromise. A compromise between what could be shown and what can be read and understood. Engage the emotion to engage the understanding. Here is the crux for all GIS Systems. The one thing that cartographers acknowledge when creating maps is that it takes something out of them. They have expended some invisible emotional energy in the act of creation. When a GIS system cries over its map then I believe we cartographers will be defunct. Design with emotion to engage the emotion. Only by feeling what the user feels can we see what the user sees. Good designers use Cartographic fictions, Cartographic impressions, cartographic illusions to make a map. All of these have emotive contents. The image is the message. Good design is a result of the tension between the environment (the facts) and the designer. Only when the reader engages the emotion, the desire, will they be receptive to the maps message. Design uses aesthetics but the principles of aesthetics are not those of design. We are not just prettying maps up. There you go...maybe we should think of updating them? Actually, I am...in a book I'm currently writing with Damien Saunder called 'Cartography.' A book. Not a web site. We're excited by it...a modern book on cartographic design that delivers principles and practical advice. As of today we're about half way through writing it and hoping it'll be published by the middle of next year. 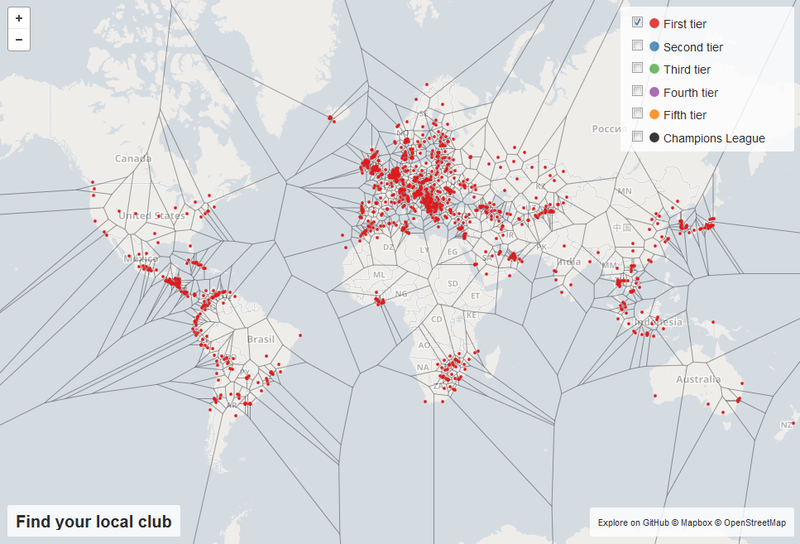 Via Keir Clarke's Maps Mania I saw the latest voronoi designed map this morning. Made by Guus Hoekman, the map uses voronoi polygons to subdivide the world such that each polygon represents a spatial partition that contains one football club. It's a neat coded solution for the novice football supporter to simply locate themselves and then determine which is their closest team. Why get all cartonerdy about it then? Well, partly because I've not had a good cartonerd rant for a few months (despite several maps causing much ire) but moreso, because maps like these never seem to go beyond providing a small technical solution to an overly simplistic question. The real world is far more complex than maps like this ever try to take on. Closest is not necessarily the way you choose your team. Football (probably most sport fandom) is a hugely complex soup. There are three rules for supporting an English football team. First, you support the team you were born and raised closest to so in that respect the map could be deemed a reasonable effort. Proximity gives ample opportunity for the young supporter to shift allegiance if parents move around a bit as well, before your fandom settles. The point here is that you don't need a map to tell you you're local birth-right football team but being close doesn't always stack up either. County or city boundaries, rivers and other features can all modify proximity. Second, you support the team your father supported. Before someone screams 'what about your mother's team? Well, to be honest your father should have already got that covered if he chose his partner wisely. This is always a good option if your parents moved to somewhere bereft of a decent team yet hailed from a footballing mecca. If neither of these solutions appeal, you simply support Manchester United because that's what you do if you've never been anywhere near Manchester. Regardless of these basic rules, supporting a team is so much more than a geometric solution that a map can provide. 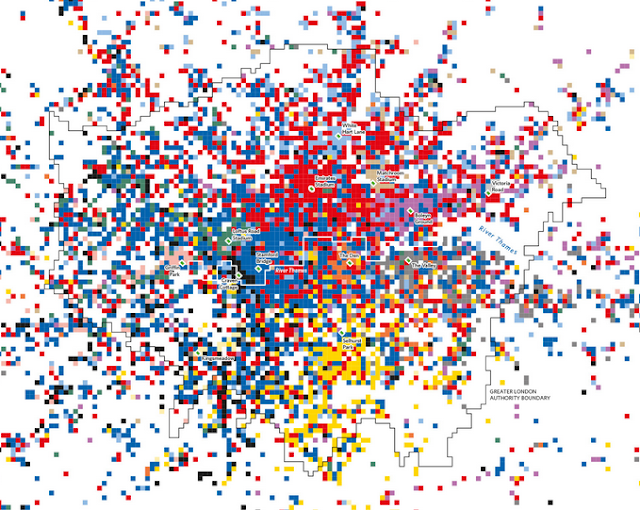 It's about territory, local rivalry, physical and social geographies and all sorts of other real world dimensions that cannot be adequately represented by voronoi polygons. The map has omissions. It fails to show the lower leagues of most countries. It only considers the men's game and for some countries, such as the U.S. the women's game is arguably more popular anyway. The map allows the classic 'neutral' fan to select a team based on tier. Why would anyone bother with lower leagues? Let's take a look at how this plays out by selecting just the first tier teams in an area I am familiar with. So in England, being from Nottingham, the map would encourage me to support Leicester City. An odd choice since local rivalry dictates this is impossible. Worse, the map suggests that I would likely be sat alongside someone from Derby. This is utterly absurd. And look more closely...the English Premier League teams are on the same map as the Welsh Football League. They just don't compare. My team is Nottingham Forest. I was born in Nottingham and raised 2 miles from the ground, on the right side of the River Trent to be a Forest fan. If my parents had decided to live on the other side of the river I'd have been a Notts County fan (shudder! )...or else I might have invoked the second principal and supported Chelsea since my father's lineage gave me that option. My mother's background was irrelevant...Rotherham United - footballing wilderness. I was fortunate when growing up that Forest happened to be one of THE most successful teams of the era (late 70s and early 80s in particular). What a fantastic quirk of location...I'd nailed it by luck alone. Tragically, they've not been so good recently (by recent, I mean 20+ years and at least once I vaguely considered invoking the Chelsea lineage) and are now in tier two. According to the map below I am at least I'm properly deliniated from that lot from Derby and Leicester with perfect walls erected...though not quite in the right spot based on the geography of the places themselves. Furthermore, most of Lincolnshire remains in Forest territory and this is wrong (unless you're my brother who sadly moved in this direction but at least maintains his footballing heritage). Adding tier 3 attributes the vast expanse of flat nothingness that is Lincolnshire to Peterborough United while Forest's polygon shrinks to make way. But that doesn't stack up either. Peterborough's average attendance is 5,600 whereas Forest's is about 20,000 so the polygon doesn't really relate to the potential pool of support. Or does it...Nottingham is a much larger city in terms of population size (310,000) that Peterborough (116,000) though much of that expanse around the town is rural and sparsely populated. So, again, voronoi representations really don't adequately represent population distribution, structure or density of the real places from which support for a team is formed. Finally when we add all teams into the mix and look at England's best supported team again...they are represented by one of the tiniest polygons. Most of Manchester United's fans live outside of this polygon and it's likely many of Manchester City's fans live inside it. So voronoi's look nice, they are easy to make and when you have a point-based dataset you can compute them to demarcate space. Whether they make any sense whatsoever is down to understanding the input data and the questions you want the resulting map to support. In this case, the geography of football fandom is so much more complex than a voronoi can ever hope to show. It's based on tweets (a dataset I've often been critical of) but heck...at least it demonstrates the complex structure of football fandom and how it is in no way possible to use a voronoi polygon as a way of reflecting on that geography. Ultimately, data isn't just data. It has context. It often requires a deeper understanding and domain knowledge before you begin to represent or map it. Often, it's incapable of being used on its own to support meaning.